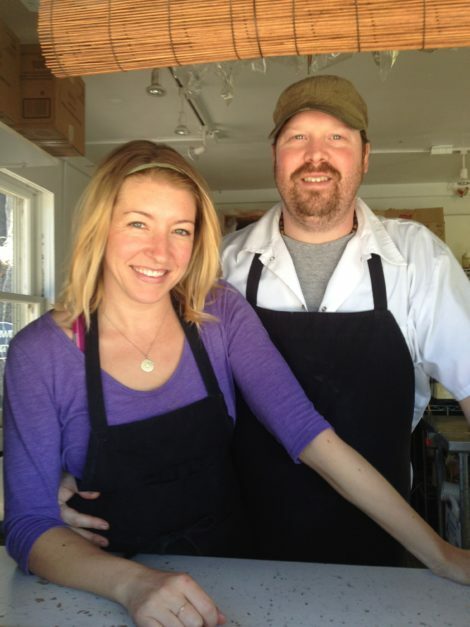 Birdie and Nick Joseph, owners of The Bistro Box in Great Barrington. Great Barrington — If you haven’t already eaten at The Bistro Box on South Main Street in Great Barrington, down past the Big Y and Guido’s, you’d better do so soon. It’s a seasonal restaurant and, as the autumn foliage now demonstrates, cold weather is almost upon us, rendering a charming outdoor restaurant not as hospitable as in warmer weather. Nick and Birdie Joseph opened their “nice shake shack” in Great Barrington in April, and by mid-summer it had become the latest “go to” place in the southern Berkshires. The owners are both graduates of the Culinary Institute of America (the food-related CIA , not the other one), so it is not surprising that their food, while casual, is top-notch. Nick is a Sheffield native, graduating from Mt. Everett in 1995. Birdie’s family moved to Sheffield from Connecticut when she was 12 years old; she graduated from Mt. Everett in 2001. After high school, Nick worked for a year at the White Hart Inn in Salisbury, and then attended the Culinary Institute of America (CIA) where he received a 2-year associate degree. Birdie went to the CIA later. Although the couple attended the same schools, they did not meet until both were working at The Marketplace in Sheffield, where Nick was a sous chef for three years. Well before the hit movie “Chef” captivated the hearts and taste buds of millions of viewers this summer, Nick and Birdie acted upon their desire to be self-employed. They wanted to serve better food than is typically found at festivals, arts and craft shows, and flea markets. So they bought a concession trailer to haul behind their RV, making and selling upscale creations such as paninis, fresh salads, and handmade soups. Not being fans of cold weather, they had been spending winters in Florida, and then traveling to various festivals during the rest of the year. They liked Florida, but even its winter warmth did not make up for the long distance from home in the Berkshires. From April through November they worked a different festival every weekend within a two-hour radius from the Berkshires. They were learning that people who attended festivals wanted healthier food and nicer options than are typically available at such events. Their paninis and wraps became popular, along with their homemade soups and shortcake with fresh whipped cream. The Bistro Box on Route 7 south of Great Barrington. Now that Nick and Birdie have a successful venue in Great Barrington, they are not traveling during the season but they may do some shows and festivals in their off-season. This year they have some small parties booked in the Berkshires through the end of December, and then they plan to travel, perhaps a cruise from Florida to Costa Rica for starters. They also plan to do some festivals and shows before reopening in April 2015. “I hope to re-open slowly starting in mid-March, depending on the weather,” Nick says. But full service will take a bit longer. Nick and Birdie try to buy as many ingredients as they can from local farmers, and they’re often inspired by what is available. “This spring I made ramp pesto because I could,” says Nick. Their hot dogs come from Whippoorwill Farm; eggs, milk, and cream from High Lawn; lettuce from Equinox Farm; tomatoes from Farm Girl Farm; ice cream from Maple Valley Farm in South Hadley; chèvre from Rawson Brook Farm; and organic coffee from Pierce Brothers in Greenfield. Burgers and fries are their top sellers. “The Box Burger is a nice blend,” says Nick, “simple but satisfying.” Well, not so simple with its tomato jam topping. But lest these favorites give a misleading idea of what the Bistro Box is all about, bear in mind that their falafel burger is another big hit. Nick says, “We like to offer some unusual items for a ‘shack joint,’ such as lobster rolls, fish tacos, and salmon burgers,” all of which are quite successful. Nick hand-cuts his French fries, and everything is made in-house, including the freshly squeezed lemonade, the fresh whipped cream, the truffle oil and Parmesan French fries, the onion rings, the vinaigrettes, the soups, and the Caesar dressing. This season the Asian salad with sesame orange vinaigrette has been the best-selling salad. The building housing the Bistro Box has been home to a long succession of failed restaurants, so a popular place with good food is a welcome newcomer. They opened in April, and business picked up a bit over Memorial Day weekend. But it quieted down until school was out, after which their business doubled. It picked up steadily over the summer and August was their best month. Lunch is typically busier than dinner, but it’s always busy from 11:30-2:30 and 5:00-6:30. Besides Nick and Birdie, there are two full-time employees, plus a number of part-timers, including several local high school students. The Bistro Box is open six days a week, but closed on Wednesdays when the Josephs sleep, catch up on paperwork, and play with Lita, their Boston terrier. This newcomer to the Great Barrington restaurant scene features café food with classic shack favorites, including the desires of everyone’s inner teenager — milkshakes and French fries. Go for it. Eating outdoors in their lovely pine grove lessens the impact of Rt 7 on your meal. A lovely east view to the mountain. Lovely on a warm day and they have remote notification so you don’t have to wait at the window for your order. Makes it seem quicker. Recommended. We camp in the foothills of the Berkshires and enjoy going to the Farmer’s Market in Great Barrington. We stop at least once a month over the summer to eat at the Bisto Box. Hand cut fries are great, the specials are never disappointing. But the favorite for us has to be the Box Burger. Yum! Tomato-Bacon-Jam. Wowie-delishishness!!! Truly inspired twists on everyones favorite foods. I applaud this hard working young couple for keeping it simple, local, and consistently delicious. Have a terrific warm winter. Yes, the food is great, but no one even mentioned that it is the ultimate dog-friendly venue. Our Akita, Kenji, LOVES the Bistro Box, its water bowl, expansive green lawn, games for young and old, isolated picnic tables, and, of course, whatever fresh delicious, locally-grown edibles happen to fall off the serving trays. All associates at BERKSHIRE PROPERTY AGENTS eat at The Bistro Box! the best place to eat in town, great food, great people.